To launch Hypo Week, they wore hypo t-shirts, trained on a hypo simulation dummy, revisited best practice by simulating both mild and severe hypoglycaemic incidences. Over three days staff manned a stand in the canteen. 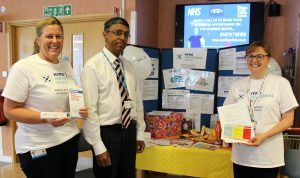 They used Hypo Week merchandise to decorate, stacked with literature, demo glucagon kits, sugary hypo treats and advice. They also created handy hypo algorithm takeaway cards for clinicians.and they ran a quiz for staff to test their knowledge. They said it was a “pleasure to meet so many different staff and to raise awareness”. In the diabetes clinic patient waiting room, they set up a hypo slideshow and handed out hypo journals, encouraging patients to log any hypos they experience and to use this to manage them more effectively. A Hypo Week article in the staff newsletter detailed symptoms and treatments, along with a round-up of the week’s activities. They also used Twitter throughout the week to inform staff, patients and the public of events.